Kitchener is a city in the Regional Municipality of Waterloo, Ontario. Located approximately 100 km (62 mi) west of Toronto, Kitchener is the regional seat. It was called the Town of Berlin from 1854 until 1912 and the City of Berlin from 1912 until 1916. The City of Kitchener covers an area of 136.86 square kilometres and had a population of 233,222 at the time of the 2016 Census. 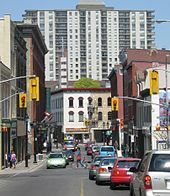 The Kitchener metropolitan area, which includes the smaller, neighbouring cities of Waterloo to the north and Cambridge to the south, has 523,894 people, making it the tenth largest Census Metropolitan Area (CMA) in Canada and the fourth largest CMA in Ontario. Kitchener and Waterloo are considered "twin cities" which are often referred to jointly as "Kitchener–Waterloo" (K–W), although they have separate municipal governments. Including Cambridge, the three cities are known as "the Tri-Cities". 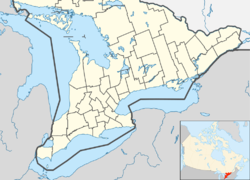 All are part of the Regional Municipality of Waterloo, which was created in 1973, when it replaced Waterloo County, which had been created in 1853. Kitchener is in Southwestern Ontario, in the Saint Lawrence Lowlands. This geological and climatic region has wet-climate soils and deciduous forests. Located in the Grand River Valley, the area is generally above 300m (1000') in elevation. Kitchener is the largest city within the Grand River watershed, and the largest city on the Haldimand Tract. Just to the west of the city is Baden Hill, in Wilmot Township. This glacial kame remnant formation is the highest elevation for many miles. The other dominant glacial feature is the Waterloo Moraine, which snakes its way through the region and holds a significant quantity of artesian wells, from which the city derives most of its drinking water. The settlement's first name, Sandhills, is an accurate description of the higher points of the moraine. Kitchener has a humid continental climate of the warm summer subtype (Dfb under the Köppen climate classification); there are large seasonal differences, usually warm and humid summers and cold to occasionally very cold winters. Winter-like conditions generally last from the mid-December until mid-March, while summer temperatures generally occur between mid-May to close to the end of September. March 2012 went down in the history books for Kitchener – between 16 and 22 March, temperatures ranged from 21.4 °C (70.5 °F) to 27.0 °C (80.6 °F)—7 record highs in a row. 19 March high of 24 °C (75.2 °F) is one of the highest winter temperatures ever recorded, while 22 March high of 27 °C (80.6 °F) is the highest for March in this area. Temperatures during the year can exceed 30 °C (86.0 °F) in the summer and drop below −20 °C (−4.0 °F) in the winter several times a year, but prolonged periods of extreme temperatures are rare. The frost-free period for Kitchener averages about 147 frost-free days a year, a much more limited number than cities on the Great Lakes due its inland location and higher elevation. Snowfall averages 160 centimetres (63 in) per year, high but not nearly as areas more directly affected by lake effect snow. The highest temperature ever recorded in Kitchener was 38.3 °C (101 °F) on August 6 & 7, 1918 and July 27, 1941. The coldest temperature ever recorded was −34.1 °C (−29.4 °F) on February 16, 2015. In 1784, the land Kitchener was built on was a 240,000 hectare area given to the Six Nations by the British as a gift for their allegiance during the American Revolution. Between 1796 and 1798, the Six Nations sold 38,000 hectares of this land to loyalist Colonel Richard Beasley. The portion of land that Beasley purchased was remote but of great interest to German Mennonite farming families from Pennsylvania. They wanted to live in an area that would allow them to practice their beliefs without persecution. Eventually, the Mennonites purchased all of Beasley's unsold land creating 160 farm tracts. Many of the pioneers arriving from Pennsylvania, known as the Pennsylvania Dutch or Pennsilfaanisch-Deitsche (German, not "Dutch"), after November 1803 bought land in a 60,000-acre section of Block Two from the German Company which was established by a group of Mennonites from Lancaster County, Pennsylvania. The tract included most of Block 2 of the previous Grand River Indian Lands. Many of the first farms were least four hundred acres in size. The German Company, represented by Daniel Erb and Samuel Bricker, had acquired the land from previous owner Richard Beasley; he had gotten into financial difficulties after buying the land in 1796 from Joseph Brant who represented the Six Nations. The payment to Beasley, in cash, arrived from Pennsylvania in kegs, carried in a wagon surrounded by armed guards. By 1800, the first buildings had been built, and over the next decade several families made the difficult trip north to what was then known as the Sand Hills. One of these Mennonite families, arriving in 1807, were the Schneiders, whose restored 1816 home (the oldest building in the city) is now a museum in the heart of Kitchener. Other families whose names can still be found in local place names were the Bechtels, the Ebys, the Erbs, the Weavers (better known today as the Webers), the Cressmans and the Brubachers. In 1816 the Government of Upper Canada designated the settlement the Township of Waterloo. Much of the land, made up of moraines and swampland interspersed with rivers and streams, was converted to farmland and roads. Wild pigeons, which once swarmed by the tens of thousands, were driven from the area. Apple trees were introduced to the region by John Eby in the 1830s, and several grist- and sawmills (most notably Joseph Schneider's 1816 sawmill, John and Abraham Erb's grist- and sawmills and Eby's cider mill) were erected throughout the area. Schneider built the town's first road, from his home to the corner of King Street and Queen Street (then known as Walper corner). $1000 was raised by the settlers to extend the road from Walper corner to Huether corner, where the Huether Brewery was built and the Huether Hotel now stands in the city of Waterloo; a petition to the government for $100 to assist in completing the project was denied. Later named the founder of Kitchener, Benjamin Eby (made Mennonite preacher in 1809, and bishop in 1812) arrived from Lancaster County, Pennsylvania in 1806 and purchased a large tract of land consisting of much of what would become the village of Berlin (named about 1830). The settlement was initially called Ebytown and was at the south-east side of what would later become Queen Street. (Eby was also responsible for the growth of the Mennonite church in Waterloo County. By 1811, Eby had built a log Mennonite meeting house first used as a school house but later also housing religious services. A new meeting house, known as Eby's Versammlungshaus, near Stirling Avenue replaced the log house in 1834 while a schoolhouse was built on Frederick Street at about the same time. Benjamin Eby encouraged manufacturers to Ebytown. Jacob Hoffman came in 1829 or 1830 and started the first furniture factory. John Eby, druggist and chemist, arrived from Pennsylvania in about 1820 and opened a shop to the west of what would later be Eby Street. At the time, it was common for settlers to form a building "bee" to help newcomers erect a log home. Immigration from Lancaster county continued heavily in the 1820s because of a severe agricultural depression in Lancaster County. Joseph Schneider, from that area, built a frame house in 1820 on the south side of the future Queen Street after clearing a farm and creating a rough road; a small settlement formed around "Schneider's Road" which became the nucleus of Berlin. The home was renovated over a century later and still stands. The village centre of what would become Berlin (Kitchener) was established in 1830 by Phineas Varnum who leased land from Joseph Schneider and opened a blacksmith shop on the site where a hotel would be built many years later, the Walper House. A tavern was also established here at the same time and a store was opened. At the time, the settlement of Berlin was still considered to be a hamlet. Immigration to the town increased considerably from 1816 until the 1870s, many of the newcomers being of German (particularly Lutheran, and Mennonite) extraction. Some were from Switzerland, like the founder of The Arthur Pequegnat Clock Company. In 1833 the town was renamed Berlin because of the recent German immigration from the Breuckmann family, and in 1853 Berlin became the County Seat of the newly created County of Waterloo, elevating it to the status of Village. The Smith's Canadian Gazetteer of 1846 describes Berlin (Kitchener) as follows: "... contains about 400 inhabitants, who are principally Germans. A newspaper is printed here, called the " German Canadian" and there is a Lutheran meeting house. Post Office, post twice a-week. Professions and Trades.—One physician and surgeon, one lawyer, three stores, one brewery, one printing office, two taverns, one pump maker, two blacksmiths." The Township of Waterloo (smaller than Waterloo County) consisted primarily of Pennsylvanian Mennonites and immigrants directly from Germany who had brought money with them. At the time, many did not speak English. There were eight grist and twenty saw mills in the township. In 1841, the township population count was 4424. The first cemetery in the city was the one next to Pioneer Tower in Doon; the first recorded burial at that location was in 1806. The cemetery at First Mennonite church is not as old, but contains the graves of some notable citizens, including Bishop Benjamin Eby who died in 1853, Joseph Schneider, and Rev. Joseph Cramer, founder of the House of Friendship social service agency. Previously part of the United County of Waterloo, Wellington and Grey, Waterloo became a separate entity in 1853 with Berlin as county seat. There had been some contentious debate between Galt and Berlin as to where the seat would be located; one of the requirements for founding was the construction of a courthouse and jail. When local merchant Joseph Gaukel donated a small parcel of land he owned (at the current Queen and Weber streets), this sealed the deal for Berlin which was still a small community compared to Galt. The courthouse at the corner of the later Queen Street North and Weber Street and the gaol were built within a few months. The first County council meeting was held in the new facility on 24 January 1853, as the county officially began operations. The Waterloo County Gaol is the oldest government building in the Region of Waterloo. The Governor's House, home of the "gaoler", in a mid-Victorian Italian Villa style, was added in 1878. Both have been extensively restored and are on Canadian Register of Historic Places. The extension of the Grand Trunk Railway from Sarnia to Toronto (and hence through Berlin) in July 1856 was a major boon to the community, helping to improve industrialization in the area. Immigrants from Germany, mostly Lutheran and Catholic, dominated the city after 1850 and developed their own newer German celebrations, and influences, such as the Turner societies, gymnastics, and band music. A new streetcar system, the Galt, Preston and Hespeler electric railway (later called the Grand River Railway) began to operate in 1894 connecting Preston and Galt. In 1911, the line reached Hespeler, Berlin and Waterloo. The electric rail system ended passenger services in April, 1955. In 1869, Berlin had a population of 3000. On 9 June 1912, Berlin was designated a city. It was renamed Kitchener in 1916, after Herbert Kitchener, 1st Earl Kitchener, a British Empire Field Marshal killed during the First World War. Kitchener was the first city in Ontario to get hydroelectric power in long-distance transmission lines from Niagara Falls, on October 11, 1910. Because citizens with a German heritage were viewed as a threat by some in Canada during the First World War, many in the city, particularly its business people, feared a backlash against the name Berlin. A 2016 news report summarized the situation as "some questioned the loyalty of a city with strong Germanic roots, and business leaders worried about a potential boycott of goods stamped Made in Berlin". A referendum was held on 19 May 1916 as to whether the city name should be changed. That passed with a small majority and another referendum led to the name change from Berlin to Kitchener, effective on 1 September 1916. By 1912, the City Hall was in the two story building at King and Frederick streets that had also been used as the Berlin town hall, completed in 1869 by builder Jacob Y. Shantz. During its tenure, the structure was used for various other purposes too, including a library, theatre, post/telegraph office, market, and jail. That building was demolished in 1924 and replaced by a new structure behind it, designed by architects William Schmalz and Bernal Jones, featuring a classical revival-style and a large civic square in front. 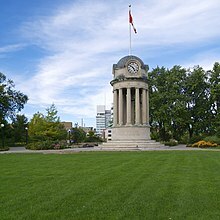 Demolished in 1973, and replaced by an office tower and shopping mall, the old City Hall's clock tower was later (1995) erected in Victoria Park. The building was not replaced by the current Kitchener City Hall on King Street until 1993; the architect for the latter was Bruce Kuwabara. During the interim years, the city had occupied leased premises on Frederick Street. In 1869, the County built a very large so-called Poorhouse with an attached farm, the House of Industry and Refuge that accommodated some 3,200 people before being closed in 1951; the building was later demolished. It was on Frederick St. in Kitchener, behind the now Frederick Street Mall and was intended to minimize the number of people begging, living on the streets or being incarcerated at a time before social welfare programmes. A 2009 report by the Toronto Star explains that "pauperism was considered a moral failing that could be erased through order and hard work". A research project by the Laurier School of Social Work has amassed all available data about the House and its residents, digitized it and made the archive available online. According to Sandy Hoy, a director of research projects, the "inmates" included not only the poor, but also those with disabilities, women, and children. Some were single women who had been servants and became pregnant. Since there were no social services, they were sent to the House. "We saw a lot of young, single mothers in the records," said Laura Coakley, a research co-ordinator. The archives also indicate that in addition to food and shelter for "inmates", in return for labour in the house and on the attached farm, the House also donated food, clothing and money for train tickets to enable the poor to reach family that might be able to support them. There were also two cemeteries for the poor nearby, including "inmates" of the House who had died. Of the cities that are now part of Waterloo Region, Berlin, now Kitchener, has the strongest German heritage because of the high levels of settlement in this area by German speaking immigrants. While those from Pennsylvania were the most numerous until about 1840, a few Germans from Europe began arriving in as 1819, including Fredrick Gaukel, a hotel keeper, being one of the firsts. He would build what later became the Walper House in Berlin. Two streets in present-day Kitchener, Frederick and Gaukel streets, are named after him. Other German-speaking immigrants from Europe arrived during the 1830s to 1850s, bringing with them their language, religion and cultural traditions. The German community became industrial and political leaders, and created a German-Canadian society unlike any other found in Canada at the time. They established German public schools and German language churches. Both the immigrants from Germany and the Mennonites from Pennsylvania spoke German, though with different dialects such as Low German or the incorrectly called Pennsylvania Dutch, actually Pennsilfaanisch Deitsch (German). (This dialect is different from Standard German with a simplified grammatical structure, some differences in vocabulary and pronunciation and a greater influence of English.) The combination of various types of German-speaking groups was a notable factor in the history of Waterloo County. The two groups of Germanics were able to understand each other quite easily and there was no apparent conflict between the Germans from Europe and those who came from Pennsylvania. Some sources estimate that roughly 50,000 Germans directly from Europe settled in and around Waterloo County, between the 1830s and 1850s. Unlike the predominantly Mennonite settlers from Pennsylvania, the majority of Germans from Europe were of other denominations: most in the first groups were Catholic and those who arrived later were primarily Lutheran. In 1862, German-speaking groups held the Sängerfest, or "Singer Festival" concert event in Berlin that attracted an estimated 10,000 people and continued for several years. Eleven years later, the more than 2000 Germans in Berlin, Ontario, started a new event, Friedensfest, commemorating Prussian victory in the Franco-Prussian war. This annual celebration continued until the start of World War I. In 1897, they raised funds to erect a large monument, with a bronze bust of Kaiser Wilhelm 1, in Victoria Park. The monument was destroyed by townspeople just after the start of World War I. A statue of Queen Victoria was erected in the park in 1911. By 1871, Berlin, Ontario, was a bilingual town with German being the dominant language spoken. More than one visitor commented on the necessity of speaking German in Berlin. Immigration from continental Germany slowed by 1880. First and second-generation descendants now comprised most of the local German population, and while they were proud of their German roots, most considered themselves loyal British subjects. The 1911 Census indicates that of the 15,196 residents in Berlin, Ontario, about 70% were identified as ethnic German but only 8.3% had been born in Germany. By the beginning of the First World War in 1914, Berlin and Waterloo County were still considered to be predominantly German by people across Canada. This would prove to have a profound impact on local citizens during the war years. During the first few months of the war, services and activities at Lutheran churches in Waterloo County continued. As anti-German sentiment increased throughout Waterloo County, many of the churches decided to stop holding services in German. The Governor General of Canada, the Duke of Connaught, while visiting Berlin, Ontario, in May 1914, discussed the importance of Canadians of German ethnicity (regardless of their origin) in a speech: "It is of great interest to me that many of the citizens of Berlin are of German descent. I well know the admirable qualities – the thoroughness, the tenacity, and the loyalty of the great Teutonic Race, to which I am so closely related. I am sure that these inherited qualities will go far in the making of good Canadians and loyal citizens of the British Empire". Before the war, most people in Ontario probably didn't give the German community a second thought. But it's important to remember that Canada was a society in transition – the country had absorbed massive numbers of immigrants between 1896 and the First World War, proportionately more than at any other time in our history. So there were these latent fears about foreigners ... It becomes very easy to stoke these racist, nativist fires and convince people there really is a threat. War propaganda is top-down driven, but it's effective because it re-enforces tendencies that already exist. A document in the Archives of Canada makes the following comment: "Although ludicrous to modern eyes, the whole issue of a name for Berlin highlights the effects that fear, hatred and nationalism can have upon a society in the face of war." The Waterloo Pioneer Memorial Tower built in 1926 commemorates the settlement by the Pennsylvania 'Dutch' (actually Pennsilfaanisch Deitsch, or German) of the Grand River area of Waterloo County. The Kitchener–Waterloo Oktoberfest is a remembrance of the region's German heritage. The event includes beer halls and German entertainment. The second largest Oktoberfest in the world, the event is based on the original German Oktoberfest and is billed as "Canada's Greatest Bavarian Festival". It attracts an average of 700,000 people to the county. During the 2016 Oktoberfest parade, an estimated 150,000 people lined the streets along the route. Granted, some do not consider Oktoberfest to be indicative of German culture in general. "The fact is, Oktoberfest in Germany is a very localized festival. It really is a Munich festival. ... [Oktoberfest in Kitchener] celebrates only a 'tiny aspect' of German culture [Bavarian]", according to German studies professor James Skidmore of the University of Waterloo. Benton and Frederick Streets (the name changes at the intersection with King Street in the foreground) form one of the most important corridors for traffic and public transit routes entering Downtown Kitchener. Kitchener's economic heritage is rooted in manufacturing. Industrial artifacts are in public places throughout the city as a celebration of its manufacturing history. While the local economy's reliance on manufacturing has decreased, in 2012, 20.36% of the labour force was employed in the manufacturing sector. The city is home to four municipal business parks: the Bridgeport Business Park, Grand River West Business Park, Huron Business Park and Lancaster Corporate Centre. The largest, the Huron Business Park, is home to a number of industries, from seat manufacturers to furniture components. Kitchener's economy has diversified to include new high-value economic clusters. In addition to Kitchener's internationally recognized finance and insurance and manufacturing clusters, digital media and health science clusters are emerging within the city. Beginning in 2004, the City of Kitchener launched several initiatives to re-energize the downtown core. These initiatives included heavy investment, on behalf of the city and its partners, and the creation of a Downtown Kitchener Action Plan. The modern incarnation of its historic farmers’ market, opened in 2004. The Kitchener Market is one of the oldest consistently operating markets in Canada. The Kitchener Market features local producers, international cuisine, artisans, and craftspeople. In 2009, the City of Kitchener began a project to reconstruct and revitalize the main street in Kitchener's downtown core, King Street. In the reconstruction of King Street, several features were added to make the street more friendly to pedestrians. New lighting was added to the street, sidewalks were widened, and curbs were lowered. Movable bollards were installed to add flexibility to the streetscape, accommodating main street events and festivals. In 2010, the redesigned King Street was awarded the International Community Places Award for its flexible design intended to draw people into the downtown core. In 2009, Tree Canada recognized King Street as a green street. The redesigned King Street features several environmentally sustainable elements such as new street trees, bike racks, planter beds that collect and filter storm water, street furnishing made primarily from recycled materials, and an improved waste management system. The street was reconstructed using recycled roadway and paving stones. In September 2012, the City of Toronto used Kitchener's King Street as a model for Celebrate Yonge – a month-long event which reduced Yonge Street to two lanes, widening sidewalks to improve the commercial street for businesses and pedestrians. 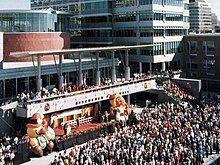 The groundbreaking ceremony for the University of Waterloo School of Pharmacy and downtown health sciences campus took place on 15 March 2006, and the facility opened in spring 2009. The building is on King Street near Victoria Street, on the site of the old Epton plant, across the street from the Kaufman Lofts (formerly the Kaufman shoe factory). McMaster University later opened a satellite campus for its Michael G. DeGroote School of Medicine next to the University of Waterloo's School of Pharmacy. The Health Sciences Campus has been central to the emergence of Kitchener's health science cluster. In 2007, Cadan Inc., a Toronto-based real estate development company, bought what had been the Lang Tannery for $10 million. Supported by the local government, Cadan repurposed the building for use by commercial firms. Since its refurbishment, the Tannery has become a hub for digital media companies, both large and small. Desire2Learn, an e-learning company, in the Tannery as the company expanded. In 2011, Communitech moved into the Tannery. Home to over 800 companies, Communitech is a hub for innovative high-tech companies in the fields of information technology, digital media, biomedical, aerospace, environmental technology and advanced manufacturing. Also in 2011, high-tech giant Google Inc. became a tenant of the Tannery, furthering its reputation as a home for leading high-tech companies. The Kitchener office is a large hub for the development for Google's Gmail application. In 2016, the University of Waterloo-sponsored startup hub Velocity Garage relocated to the building, bringing over 100 additional startup companies into the Tannery. The Province of Ontario built a new provincial courthouse in downtown Kitchener, on the block bordered by Frederick, Duke, Scott and Weber streets. The new courthouse is expected to create new jobs, mainly for the courthouse, but also for other businesses, especially law offices. The new courthouse construction began in 2010. In the downtown area, several factories have been transformed into upscale lofts and residences. In September 2010, construction began on the ‘City Centre’ redevelopment project in downtown Kitchener. This redevelopment project will include condominium units, new retail spaces, private and public parking, a gallery, and a boutique hotel. The former Arrow shirt factory has been converted into a luxury, high-rise apartment building, featuring loft condominiums. In 2012, Desire2Learn, in downtown Kitchener, received $80 million in venture capitalist funding from OMERS Ventures and New Enterprise Associates. The downtown area was in a boom phase by late 2017, with $1.2 billion in building permits for 20 new developments expected by the end of February 2019. That would add 1,000 apartments and 1,800 condominium units. The City indicated that the development would be a "mixture of high-density residential buildings with ground-floor retail, and office buildings with ground-floor retail". Since the Ion rapid transit (light rail) system, operated by Grand River Transit, was approved in 2009, "the region has issued $2.4 billion in building permits within the LRT corridor". At the time of the Canada 2006 Census, the population of Kitchener was 204,668. In the Canada 2011 Census, the population of Kitchener was 219,153. By gender, 49.2% of the population was male and 50.8% was female. Children under five accounted for approximately 6.0% of the resident population of Kitchener, compared to 5.5% in Ontario, and 5.3% for Canada overall. Some 11.7% of the resident population in Kitchener was of retirement age, a smaller proportion of the population compared to 13.6% in Ontario, and 13.7% in Canada. The median age was 37 years, younger than the 39 years for Ontario, and 40 years for Canada. In the five years between 2001 and 2006, the population of Kitchener grew by 7.5%, higher than the growth rates for both Ontario (6.6%) and Canada (5.4%). Population density of Kitchener was 1,495 people per square kilometre. According to the 2006 Census, most of the population is of European ancestry; the city has a substantial concentration of German Canadians. 15.4 percent of the population claimed to be members of a visible minority. The largest visible minority groups are: Black: 3.2%, South Asian: 3.1%, Latin American: 2.2%, Southeast Asian: 2.0%, Chinese: 1.4%, and Others. From the 2001 census, 78.85% of the population adhered to various Christian denominations. Members of Protestant churches formed 41.3%, followed by Roman Catholics (32.4%), while the remaining 5.1% follow other Christian denominations such as Eastern Orthodox, LDS, and Jehovah's Witness. Other religions include Islam: 2.24%, Hindu: 1.00%, plus others including Judaism, Sikhism, Buddhism and Baha'i, while 15.6% claim no religious affiliation at all. Kitchener is governed by a council of ten councillors, representing wards (or districts), and a mayor. Council is responsible for policy and decision making, monitoring the operation and performance of the city, analyzing and approving budgets and determining spending priorities. The residents of each ward vote for one person to be their city councillor; their voice and representative on city council. Municipal elections are held every four years in late October. Kitchener was part of Waterloo County, Ontario until 1973 when amalgamation created the Regional Municipality of Waterloo. The region handles many services, including fire, police, waste management, community health, transit, recreation, planning, roads and social services. Kitchener residents elect four councillors at large to sit with the mayor on the Regional council. The mayor of Kitchener is Berry Vrbanovic, who was elected to his first term in October 2014. See Kitchener City Council for a complete list of councillors. In 1976, residents of Kitchener voted almost 2:1 in favour of a ward system. The first municipal election held under the ward system occurred in 1978. In 2010, the city underwent a ward boundary review. A consultant proposed boundaries for a 10-ward system for the 2010 municipal election, adding 4 additional councillors and wards to replace the previous 6-ward system. The Member of Provincial Parliament (MPP) for Kitchener Centre is Laura Mae Lindo. Other MPPs include Mike Harris Jr. (Kitchener-Conestoga) and Catherine Fife (Kitchener–Waterloo) who both represent small portions of the city in addition to adjacent areas. The federal Members of Parliament (MPs) are as follows: Raj Saini (Kitchener Centre), Harold Albrecht (Kitchener-Conestoga), Marwan Tabbara (Kitchener South—Hespeler) and The Hon. Bardish Chagger (Waterloo). Kitchener has several public high schools, with Kitchener–Waterloo Collegiate and Vocational School, founded in 1855, being the oldest. It is located on King Street in the northern area of the city, not far from the boundary of Waterloo. In the 1950s and 1960s several new high schools were constructed, including Eastwood Collegiate Institute in what was then the southeastern part of the city in 1956, Forest Heights Collegiate Institute in the western Forest Heights part of the city in 1964, Grand River Collegiate Institute in the northeastern Heritage Park/Grand River Village area in 1967, and Cameron Heights Collegiate Institute in the southern area of the Downtown core in 1967. In 2006, Huron Heights Secondary School opened in southwestern Kitchener. It opened with a limited enrollment of only 9th and 10th grade students, and has since expanded to full capacity in the 2008–2009 school year. The oldest Catholic high school in the city is St. Mary's High School, which opened in 1907 as a girls-only Catholic school. It was transformed into a co-ed institution in 1990 after the closure of the neighbouring St. Jerome's High School, which had been a boys-only Catholic school. The same year, a second Catholic high school, Resurrection Catholic Secondary School, opened in the west of the city. In 2002, St. Mary's abandoned its downtown location in favour of a new one in the city's southwest. The former St. Jerome's High School houses the Lyle S. Hallman Faculty of Social Work from Wilfrid Laurier University. It opened at this location in 2006, bringing 300 faculty, staff and students to downtown Kitchener. The former St. Mary's High School building, meanwhile, has been transformed into both the head office of the Waterloo Catholic District School Board and the Kitchener Downtown Community Centre. The Doon neighbourhood, once a separate village, is now part of Kitchener. It is home to the primary campus of Conestoga College, one of the foremost non-university educational institutions in the province. For nine consecutive years, Conestoga has earned top overall ranking among Ontario colleges on the Key Performance Indicator (KPI) surveys, which measure graduate employment rates and satisfaction levels, and employer and student satisfaction. It is one of only seven polytechnical institutes in Canada. The University of Waterloo opened a School of Pharmacy in the downtown area. The City of Kitchener has contributed $30 million from its $110 million Economic Development Investment Fund, established in 2004, to the establishment of the UW Downtown Kitchener School of Pharmacy. Construction began in 2006, and the pharmacy program was launched in January 2008 with 92 students. The school is expected to graduate about 120 pharmacists annually and will become the home of the Centre for Family Medicine, where new family physicians will be trained, as well as an optometry clinic and the International Pharmacy Graduate Program. Construction on the $147 million facility was largely finished in spring 2009. The University of Waterloo's (UW) Downtown Kitchener Health Sciences Campus is also the site of a satellite campus for McMaster University's School of Medicine. The Michael G. DeGroote School of Medicine admits 28 students per year to the MD program at the Waterloo Regional Campus. Students complete their clinical placements at hospitals and medical centres in the Waterloo-Wellington Region. McMaster's satellite campus also features the Centre for Family Medicine, a family health team, and the University of Waterloo's School of Optometry clinic. Emmanuel Bible College is also in Kitchener, at 100 Fergus Avenue. Hospital services are provided by Grand River Hospital which includes a Freeport Campus and St. Mary's General Hospital, both located in Kitchener, as well as Cambridge Memorial Hospital. All three were highly ranked for safety in a national comparison study in 2017-2018, particularly the two located in Kitchener, but all would benefit from reduced wait times. Long-term care beds are provided at numerous facilities. Grand River Hospital has a capacity of 574-beds; Freeport Health Centre was merged into GRH in April 1995. That secondary campus provides complex continuing care, rehabilitation, longer-term specialized mental health and other services. Built originally as a tuberculosis sanatorium and home for the terminally ill, Freeport also housesthe palliative care unit. The King St. location is also the home of the Grand River Regional Cancer Centre which opened in 2003. St. Mary's General Hospital is a 150-bed adult acute-care facility and includes the Regional Cardiac Care Centre with two cardiovascular operating rooms, an eight bed cardiovascular intensive care unit and 45 inpatient beds. As of late 2018, Cambridge Memorial had 143 beds but was in the midst of a major expansion expected to be completed in 2021; that will add 54 new beds and double the size of the Emergency department. Family doctors are often in short supply in K-W, and a source of great concern among residents. Recruiting efforts over the previous 15 years certainly achieved some success as of September 2018, but needed to be continued. Announced January 2006, as a new School of Medicine, the Waterloo Regional Campus of McMaster University was completed in 2009. In 2018, the campus included "a complete on-site clinical skills laboratory with 4 skills rooms and 2 observation rooms, classrooms with video-conferencing capabilities and a state-of-the-art anatomy lab that was built in 2013 with a high definition video system", according to the University. Its Michael G. DeGroote School of Medicine building includes the Centre for Family Medicine and the University of Waterloo School of Optometry and Vision Science. Kitchener is home to the largest Oktoberfest celebration outside of Germany. Kitchener's cultural highlights include CAFKA, The Open Ears Festival, IMPACT theatre festival, the Multicultural Festival, the Kitchener Blues Festival and KidsPark, many of which are free to the public. Kitchener is also home to venues such as Homer Watson House & Gallery, Kitchener–Waterloo Art Gallery, THEMUSEUM, JM Drama Alumni and Centre In The Square. Also the Cities recently had two local and regional museums built in the region, one being the Waterloo Region Children Museum and the Doon Heritage Museum. Live music by popular artists can be heard at venues such as Centre In The Square and The Aud. The Kitchener Public Library is another community stalwart. Kitchener is also home to independent music label, Busted Flat Records which features the music of many Kitchener–Waterloo based musicians. Kitchener–Waterloo's Oktoberfest celebration is an annual nine-day event that started in 1969. Based on the original German Oktoberfest, it is billed as Canada's Greatest Bavarian Festival. It is held every October, starting on the Friday before Canadian Thanksgiving and running until the Saturday after. It is the largest Bavarian festival outside of Germany. While its best-known draws are the beer-based celebrations, other family and cultural events also fill the week. The best-known is the Oktoberfest Thanksgiving Day Parade held on Thanksgiving Day; as it is the only major parade on Canadian Thanksgiving, it is televised nationally. Another icon of the festival is Miss Oktoberfest. This festival ambassador position is selected by a closed committee of judges from a panel of local applicants; community involvement and personal character are the main selection criteria. The festival attracts an average of 700,000 people. During the 2016 Oktoberfest parade, an estimated 150,000 lined the streets along the route. Various locations in Kitchener and Waterloo were used to portray the fictional Ontario town of Wessex in the filming of Canadian television sitcom Dan for Mayor, starring Corner Gas star Fred Ewanuick. A local folk group, Destroy All Robots, wrote a tongue-in-cheek song jibing the city of Kitchener, "Battle Hymn of the City of Kitchener, Ontario". The Kitchener Blues Festival is a four-day festival in downtown Kitchener dedicated to blues music, always held in August on the weekend following the civic holiday. The festival has expanded to four stages and two workshop stages throughout the downtown area, with over 90 performances. It has grown from a one-day event with an attendance of 3,000 to a four-day event with over 150,000 attending. In 2014 the Kitchener Blues Festival celebrated its 14th year. This is a two-day event in Victoria Park commencing usually on the first weekend of the summer. The festival features foods, dance and music from around the world. The festival also showcases several vendors that sell artifacts and crafts from around the world. This festival has been ongoing for well over 40 years. Well over 50,000 attend every year. KOI Music Festival is a three-day festival held annually in downtown Kitchener each September. The festival was started in 2010 and has since expanded to include a free concert on Friday and a full day of performance Saturday and Sunday. KOI features more than 100 rock bands every year, with a large focus on local, independent musicians. Notable past performers include Every Time I Die, Ubiquitous Synergy Seeker, Chiodos, Walk Off The Earth, Four Year Strong, Protest the Hero, Mad Caddies, Monster Truck, Gob, Treble Charger, Cute Is What We Aim For, The Planet Smashers, Bayside, and several hundred more. Kultrún is an annual festival of world music, food, culture, and art that takes place in Victoria Park each July. Music from various cultures is performed on two stages, and the rest of the park is covered with vendors selling their goods. A key part of the festival is the large number of food stands selling foods from all different ethnic backgrounds. 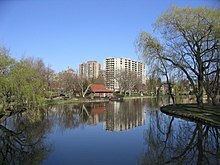 Kitchener's oldest outdoor park is Victoria Park, in the heart of downtown Kitchener. Numerous events and festivities are held in this park. A cast-bronze statue of Queen Victoria is in Victoria Park, along with a cannon. The statue was unveiled in May 1911, on Victoria Day (the Queen's birthday) in the tenth year after her death. The Princess of Wales Chapter of the Imperial Order of the Daughters of the Empire raised the $6,000 needed for the monument. Another significant beauty spot in the city is Rockway Gardens. Adjacent to the Rockway golf course, the gardens occupy a long narrow strip of land alongside King Street as it rushes down to meet the Conestoga Parkway and become Highway 8. Here there are many fountains, ponds, waterfalls and rock grottoes. It is a popular site for wedding photos in the summer. Kitchener has an extensive and safe community trail system. The trails, which are controlled and run by the city, are hundreds of kilometres in length. Due to Kitchener's close proximity to the Grand River, several community trails and paths border the river's shores. This convenient access to the Grand River has drawn nature-seeking tourists to the city. However, Kitchener's trails and especially natural areas remain underfunded by city council and as a result, many are not adequately maintained. In 2011, a bike park at the newly constructed McLennan Park, in the city's south end, was hailed as one of the best city-run bike parks in Southern Ontario by BMX and mountain biking enthusiasts. The bike park offers a four-cross (4X) section, a pump track section, a jump park, and a free-ride course. McLennan Park also features an accessible play area, a splash pad, basketball courts, beach volleyball courts, a leash-free dog area, and a toboggan hill. Chicopee Ski Club is also within the city limits. Kitchener was very proactive and visionary about its transportation network in the 1960s, with the province undertaking at that time construction of the Conestoga Parkway from the western boundary (just past Homer Watson Boulevard) across the south side of the city and looping north along the Grand River to Northfield Drive in Waterloo. Subsequent upgrades took the Conestoga west beyond Trussler Road and north towards St Jacobs, with eight lanes through its middle stretch. The Conestoga Parkway bears the provincial highway designations of Highways 7 and 8. King Street becomes Hwy 8 where it meets the Conestoga in the south and leads down to the 401, but Old King Street survives as the street-route through Freeport to the Preston area of Cambridge. Up until construction of the Conestoga, Highland Road through Baden had been the primary highway to Stratford. Victoria Street was then and remains the primary highway to Guelph but this is slated to be bypassed with an entirely new highway beginning at the Wellington Street exit and running roughly north of and parallel to the old route. There are two interchanges with Highway 401 on Kitchener's southern border. In addition to the primary link where Hwy 8 merges into the Hwy 401, there is another interchange on the west side with Homer Watson Boulevard. In order to reduce the congestion on Highway 8, a new interchange has been proposed on Highway 401 at Trussler Road, which would serve the rapidly growing west side of Kitchener. Although this proposal is supported by the Region of Waterloo, the Ontario Ministry of Transportation has no plans to proceed with an interchange at Trussler Road. Unlike most southern Ontario cities whose streets follow a strict British grid survey pattern, Kitchener's streets are laid out in a complex radial pattern on the Continental models most familiar to the German settlers. There is good historical reason for this. Kitchener was one of the few places in Ontario where the settlers arrived in advance of government surveyors. The Mennonites who had banded together as the German Company to purchase the township from Richard Beasley simply divided their vast parcel of land by the number of shareholder households and then drew random lots to confer title on individual farms. There was no grid survey done—no lines, no concessions, no right-of-way corridors for roads. When it came time to punch roads through the wilderness, the farmers modelled the road network on what was familiar to them, which was the pattern of villages in Switzerland and southern Germany. This is a Continental Radial pattern and the result was major streets extended through diagonals cutting across the grid of smaller streets and converging at multiple-point intersections which, as the communities became more prosperous and if the automobile had not displaced the horse, might someday have become roundabouts decorated with circular gardens, fountains or statuary in the style of European cities. Five-point intersections created by converging diagonals are legion in the older areas. In 2004, roundabouts were introduced to the Region of Waterloo. Besides improving traffic flow, they will help the region lower pollution from emissions created by idling vehicles. In 2006, the first two were installed along Ira Needles Boulevard in Kitchener. Some people[who?] argue roundabouts are ideal for intersections in this region because of the aforementioned historical growth along Continental radial patterns versus the British grid systems, but all installs have been at T and cross intersections making the point irrelevant. A controversial plan would extend River Road through an area known as Hidden Valley, but the pressure of traffic and the absence of any other full east-west arterials between Fairway Road and the Highway 401 is forcing this development ahead. Most streets that cross the municipal boundary between Kitchener and Waterloo retain the same street name in both cities. However, several streets which are divided into east and west sections in Kitchener shift to a north-south division in Waterloo. This primarily affects Weber and King Streets and Westmount Road. Since these roads do not actually change their primary directional alignment significantly, (Weber Street and King Street, supposedly "Parallel" streets, cross 3 times), the shift in labelling can create confusion, since each of the aforementioned thoroughfares bears the labels north, south, west, and east on certain segments. However, it also reduces the potential confusion that would result from having separate west and east segments of the same street existing simultaneously in both cities. The problem with giving streets in Waterloo Region compass-based labels, and attempting to divide each of the cities into quadrants comes from the radial layout of the roads, and the historical patterns of development. Waterloo's quadrants, created by the intersection of King and Erb Streets, roughly correspond to compass directions, but Kitchener's quadrants, delineated by King and Queen Streets, do not resemble compass directions whatsoever. A notable case is that of Lancaster Street, which runs almost exactly north-south, but is designated as east-west, since it crosses Queen Street, which divides the "east" and "west" halves of the city, yet follows a northeast-southwest orientation itself. Since 2000, public transport throughout the Region of Waterloo has been provided by Grand River Transit, which was created by a merger of the former Cambridge Transit and Kitchener Transit. GRT operate a number of bus routes in Kitchener, with many running into Waterloo and two connecting to Cambridge. In September 2005, GRT added an express bus route called iXpress from downtown Cambridge through Kitchener to north Waterloo. On 31 October 2009, GO Transit began to provide service to Kitchener with regional bus service from Charles Street Terminal to Mississauga (Square One Bus Terminal) on weekdays and weekends. On 19 December 2011, GO Transit began train service to Kitchener with two weekday each direction to Union Station in Toronto. The route has been renamed from Georgetown GO Line to Kitchener GO Line to reflect this extension. In June 2011, Waterloo Region council confirmed approval of the plan for an electricity-powered light rail transit (LRT) line between Conestoga Mall in north Waterloo and Fairview Park Mall in south Kitchener, with rapid buses through to the "downtown Galt" area of Cambridge. In this Stage 1, the Ion rapid transit train will run through the downtown/uptown areas of Kitchener and Waterloo. Construction on the light rail system began in August 2014 and the Stage 1 service was expected to begin in 2017. Most of the rails had been installed by the end of 2016; the maintenance facility and all underground utility work had been completed. The start date of service was postponed to early 2018, however, because of delays in the manufacture and delivery of the vehicles by Bombardier Transportation; as of 24 February 2017, only a single sample of a train car had arrived for testing. The start of service was then further delayed; as of September 2018, service is planned to begin in December 2018. Trains are now regularly testing on the ION route. Until light rail transit is extended to the "downtown Galt" area of Cambridge from Kitchener in Stage 2, rapid transit will be provided by bus; adapted iXpress buses will run between Fairview Park Mall and the Ainslie Street Transit Terminal. In late February 2017, plans for the Stage 2 (Cambridge section) of the Ion rail service were still in the very early stage; public consultations were just getting started at the time. Passenger rail service has long been a point of frustration for residents of Kitchener and its neighbouring cities. Two main lines come westward out of Toronto and then meet up again in London. The northern line passes through Brampton, Guelph, Kitchener and Stratford before arriving in London. The southern line goes along the heavily populated lakeshore to Oakville, Burlington, northern Hamilton, Brantford, Woodstock, and then to London. This southern line is the primary rail corridor for CN, while the northern line through Kitchener is owned by a short-line railway called the Goderich-Exeter Railway (GEXR). The track and signalling conditions on the north and south route are very different, so that trains on the southern route can operate more frequently and faster, while trains on the northern route take 1 hour and 40 minutes on average to get from Kitchener to Toronto. In addition, because it is a single-track route, trains often need to pull into sidings to let oncoming trains pass. Consequently, Kitchener, with a regional population base equal to London and situated much closer to metropolitan Toronto, gets less than one third the frequency of passenger rail service. Passenger service is provided by Via Rail. Two trains in each direction travelling between Sarnia and Toronto stop at the Kitchener railway station daily. The station is slightly to the northeast of the city's downtown on Weber Street near its intersection with Victoria Street. GO Transit bus service began in Kitchener on 31 October 2009, connecting to the Milton GO Station and Mississuaga City Centre GO Terminal. GO Train service from the Kitchener railway station began on 19 December 2011. On May 19, 2017, at Google's Canadian headquarters in Kitchener, Ontario Premier Kathleen Wynne announced funding for an environmental assessment for high speed rail service to Toronto, London and Windsor. The proposal, if approved, would provide a 48-minute trip from Kitchener to downtown Toronto. Depending on the outcome of the environmental assessment (and the 2018 provincial election), Toronto service could begin in 2025. Freight trains in Kitchener are operated by the Goderich-Exeter Railway and the Canadian Pacific Railway. These railways serve several customers, many of which are in industrial parks in southern Kitchener. The closest airport to Kitchener is the Region of Waterloo International Airport in nearby Breslau, about 12 km by road from downtown Kitchener. While it is a thriving general-aviation field, it is not heavily served by scheduled airlines. WestJet offers year-round service to Calgary and weekly service to Orlando in the winter. Sunwing Airlines offers seasonal service to Cayo Santa Maria. Most air travellers use Toronto's Lester B. Pearson International Airport or John C. Munro Hamilton International Airport. There is a helipad in Kitchener near Google's Kitchener offices. In June, 2017 the helipad was temporarily closed due to possible interference from a construction crane on the flight path. There are 10 wards, and 53 planning communities or neighbourhoods. There are also 29 neighbourhood associations recognized by the city, which in some cases do not correspond to the names and boundaries of planning communities designated by the City. In some cases the neighbourhood associations cover several neighbourhoods and/or planning communities and the name of one neighbourhood is sometimes used to refer to the entire area. The Stanley Park Neighbourhood Association, for example, covers much of the eastern and southeastern area of the city including the planning communities of Stanley Park, Heritage Park, Idlewood, and Grand River North and South. Further complicating things is that the first area of development named Stanley Park, which is where Stanley Park school is located and where Stanley Park Conservation Area is located, has been included within the city's planning district of Heritage Park, leaving only later-developed areas of Stanley Park plus an adjacent residential neighbourhood to the south, originally referred to as Sunnyside, in the Stanley Park planning neighbourhood. The Forest Heights Neighbourhood Association includes the Forest Heights neighbourhood/planning district to the east of Forest Heights proper. K-W United FC, a soccer team that plays in the USL Premier Development League (PDL) in the Great Lakes Division of the Central Conference. Kitchener Rangers of the Ontario Hockey League who play at the Kitchener Memorial Auditorium Complex. Kitchener Panthers of the Intercounty Baseball League who play at Jack Couch Park. Kitchener Dutchmen of the Ontario Hockey Association who play at the Kitchener Memorial Auditorium Complex. K-W Braves Jr. A Lacrosse of the Ontario Lacrosse Association who play at the Kitchener Memorial Complex Kinsmen Arena. K–W Kodiaks Lacrosse of the Major Series Lacrosse who play at the Waterloo Rec Centre. Kitchener and District Soccer League, a semi-pro men's soccer league with teams from Kitchener and other surrounding cities. Kitchener Fastball League contains 14 teams and plays at Budd Park. Kitchener Minor Hockey Association (KMHA) which helps thousands of children play recreational and house league hockey. Kitchener Wildcats of the Kitchener Ringette Association has recreational and house league ringette. Dutch Boy Drum and Bugle Corps division III Drum and Bugle Corps. Tri-City Titans of the North American Football League who play at the Centennial Stadium, which is also part of the Kitchener Memorial Auditorium Complex. Tri-City Outlaws of the Northern Football Conference who play at Rogers Field in Cambridge are made up of players from Kitchener, Waterloo, Cambridge, and Guelph. Kitchener–Waterloo Dragons, indoor field hockey club. Region of Waterloo Tigers Volleyball Club, a member of the Ontario Volleyball Association that provides youth with both a developmental program as well as competitive teams in Kitchener, Waterloo and surrounding areas. Founded in 1978. There are two lawn bowling clubs in Kitchener: Heritage Greens and Kitchener, which both function as part of Home District 7 of the Ontario Lawn Bowling Association. Kitchener Minor Girls Softball Association (Kitchener Klassics) girls softball/fastball league. Kitchener–Waterloo Asahi Judo Club established in 1967, who practice out of the Twin Cities Gymnastics and Judo Training Center. Chicopee Ski Club, member of Alpine Ontario South, home club of various junior and adult alpine ski racing teams. Kitchener Minor Baseball Association provides both house league and rep team experiences for boys and girls who wish to play Blue Jays-style baseball. Tri-City Roller Derby, members of the international Women's Flat Track Derby Association, play competitive roller derby at venues in Waterloo, Kitchener and New Hamburg. Kitchener Waterloo Track and Field Association. Promotes health and fitness through a variety of Track and Field events for the Kitchener/Waterloo area. Waterloo County Rugby Football Club. Member of Ontario Rugby Union. Offers social and competitive sides for ages 4 and up. District 8 Athletic Association, a secondary school sports association servicing the Catholic and Independent high schools of the Kitchener, Waterloo and Cambridge. A member of Central Western Ontario Secondary Schools Association and Ontario Federation of School Athletic Associations. Team Grand River Rocks. Kitchener's only rock climbing team representing the Grand River Rocks climbing gym (in downtown Kitchener) at local, provincial, national, and international youth competitions. ^ a b c d "Kitchener (city) census profile". 2016 Census data. Statistics Canada. Archived from the original on 13 February 2017. Retrieved 12 February 2017. ^ a b "Kitchener – Cambridge – Waterloo (Census metropolitan area)". 2016 Census data. Statistics Canada. Archived from the original on 13 February 2017. Retrieved 12 February 2017. ^ "Kitchener". Natural Resources Canada. 6 October 2016. ^ a b c "Waterloo Wellington A". Canadian Climate Normals 1981–2010. Environment Canada. Archived from the original on 16 February 2015. Retrieved 12 April 2014. ^ a b "Daily Data Report for August 1918". Environment Canada. Archived from the original on 19 August 2016. Retrieved 5 August 2016. ^ a b "Daily Data Report for July 1941". Environment Canada. Archived from the original on 19 August 2016. Retrieved 5 August 2016. ^ a b "Daily Data Report for February 2015". Environment Canada. Archived from the original on 19 August 2016. Retrieved 5 August 2016. ^ a b "Kitchener". Environment Canada. Archived from the original on 19 August 2016. Retrieved 5 August 2016. ^ "Daily Data Report for Kitchener/Waterloo (February 2016)". Environment Canada. Archived from the original on 19 August 2016. Retrieved 17 March 2016. ^ "Kitchener/Waterloo". Environment Canada. Archived from the original on 19 August 2016. Retrieved 5 August 2016. ^ "Region of Waterloo Int'l A". Environment Canada. Archived from the original on 19 August 2016. Retrieved 5 August 2016. ^ "Daily Data Report for January 2005". Environment Canada. Archived from the original on 19 August 2016. Retrieved 5 August 2016. ^ a b c d "History" (PDF). Waterloo Historical Society 1930 Annual Meeting. Waterloo Historical Society. 1930. Archived (PDF) from the original on 27 February 2017. Retrieved 13 March 2017. ^ a b "Kitchener–Waterloo Ontario History – To Confederation". Archived from the original on 25 May 2017. Retrieved 28 August 2017. ^ "Waterloo Township". Waterloo Region Museum Research. Region of Waterloo. 2013. Archived from the original on 27 February 2017. Retrieved 13 March 2017. To correct the situation, a formal agreement was arranged between Brant and Beasley. This arrangement allowed Beasley to sell the bulk of Block Two in order to cover his mortgage obligations completely, while giving the Mennonite buyers legal title to land they had previously purchased. Subsequently, Beasley sold a 60,000 acre tract of land to the German Company of Pennsylvania represented by Daniel Erb and Samuel Bricker in November 1803. Beasley's sale to the German Company not only cleared him of a mortgage debt, but left him with 10,000 acres of Block Two land which he continued to sell into the 1830s. ^ "City of Kitchener". Kitchener.ca. Archived from the original on 12 July 2010. Retrieved 26 May 2012. ^ "Joseph Schneider Haus". Region of Waterloo. Archived from the original on 23 May 2012. Retrieved 26 May 2012. .
^ Mills, Rych (17 December 2016). "'Benchi' – Bishop Benjamin Eby was a builder and Berlin booster". Waterloo Region Record. Archived from the original on 28 March 2018. Retrieved 12 June 2017. ^ "Waterloo Township". Waterloo Region Museum Research. Region of Waterloo. 2013. Archived from the original on 27 February 2017. Retrieved 13 March 2017. ^ Smith, Wm. H. (1846). SMITH'S CANADIAN GAZETTEER – STATISTICAL AND GENERAL INFORMATION RESPECTING ALL PARTS OF THE UPPER PROVINCE, OR CANADA WEST:. Toronto: H. & W. ROWSELL. p. 15. ^ Smith, Wm. H. (1846). SMITH'S CANADIAN GAZETTEER – STATISTICAL AND GENERAL INFORMATION RESPECTING ALL PARTS OF THE UPPER PROVINCE, OR CANADA WEST:. Toronto: H. & W. ROWSELL. pp. 205–206. ^ Thompson, Catherine (31 January 2016). "Mennonite cemetery offers glimpse into Kitchener's earliest days". Waterloo Region Record. Archived from the original on 2 February 2016. Retrieved 11 October 2017. ^ mills, rych (14 July 2017). "Flash from the Past: Seven meetings that decided Waterloo County". Therecord.com. Retrieved 7 August 2018. 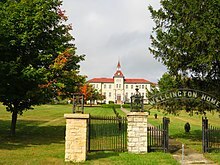 ^ a b c "Waterloo County Jail and Governor's House". Canada's Historic Places. Archived from the original on 13 July 2015. Retrieved 1 July 2015. ^ "Discovering the Region" (PDF). Doors Open, Region of Waterloo. Region of Waterloo. 2015. Archived from the original (PDF) on 29 August 2013. Retrieved 23 March 2017. ^ "CAMBRIDGE AND ITS INFLUENCE ON WATERLOO REGION'S LIGHT RAIL TRANSIT". Waterloo Region. Waterloo Region. 19 January 2017. Archived from the original on 12 March 2017. Retrieved 10 March 2017. ^ Mills, Rych (10 January 2017). "Flash From the Past: Preston Car and Coach goes up in smoke". Record. Kitchener. Archived from the original on 11 January 2017. Retrieved 10 March 2017. ^ Pender, Terry (10 October 2010). "Power for the people: Power flowed 100 years ago this month". Waterloo Region Record. Retrieved 7 August 2018. ^ "From Berlin to Kitchener: City changed name 100 years ago". Waterloo Region Record. 1 September 2016. Retrieved 19 March 2019. ^ Allemang, John (26 August 2016). "One hundred years after disappearing, Berlin (Ontario) shows signs of revival". Globe and Mail. Retrieved 19 March 2019. The declaration of war marked the beginning of vicious, violent antagonism on an international scale, and Berliners became collateral damage through a simple seismic shift of global alliances. ^ Outhit, Jeff (27 June 2016). "June 28, 1916: Exactly 346 people voted for Berlin to be renamed Kitchener". Waterloo Region Record. Retrieved 19 March 2019. ^ "Flash from the Past: Berlin's market building also housed post office, council chamber". Waterloo Region Record. 17 September 2018. Retrieved 24 March 2019. ^ "Flash From the Past: Controversy and Kitchener's city halls seem to go together". Waterloo Region Record. 22 March 2019. Retrieved 24 March 2019. ^ "Flash from the Past: Berlin's market building also housed post office, council chamber". Waterloo Region Record. 16 June 2015. Retrieved 24 March 2019. ^ Tyler, Tracey (3 January 2009). "When 'poorhouse' wasn't only an expression". Toronto Star. Toronto. Archived from the original on 14 March 2017. Retrieved 13 March 2017. ^ Mercer, Greg (12 March 2017). "A virtual museum for the 'poorhouse'". Record. Kitchener. Archived from the original on 14 March 2017. Retrieved 13 March 2017. ^ "Waterloo County House of Industry and Refuge". Waterloo House of Refuge. Social Innovation Research Group. March 2017. Archived from the original on 14 March 2017. Retrieved 13 March 2017. The poorhouse was one of the earliest forms of social welfare available to people without other options for food, shelter, or the care needed for their survival. The poorhouse became the place to send people who were very poor, desperate, distressed, disabled, pregnant without support, old, or ill so that they were outside the view of other citizens. ^ "House of Industry and Refuge Cemetery". Find A Grave. Find A Grave. 2016. Archived from the original on 14 March 2017. Retrieved 13 March 2017. The first starting in 1869 was located north of the railroad tracks which run parallel to Victoria St. It continued in operation until 1884 when a new cemetery was started ... bounded by Dunham Avenue, Mansion Street and Indiana Street. ^ Mercer, Greg (25 January 2015). "Searching for Kitchener's lost graveyards". Waterloo Region Record. Archived from the original on 14 March 2017. Retrieved 25 March 2017. ^ "10 things to know about Mennonites in Canada". Web.archive.org. Archived from the original on 14 March 2017. ^ "Building Community on the Frontier – the Mennonite contribution to shaping the Waterloo settlement to 1861" (PDF). Mennonite Historical Society of Ontario. Retrieved 11 November 2018. ^ "Religion in Waterloo North (Pre 1911)". Waterloo Region. Waterloo Region. 2015. Archived from the original on 21 March 2017. Retrieved 21 March 2017. ^ "German Canadians". The Canadian Encyclopedia. The Canadian Encyclopedia. 2016. Archived from the original on 2 February 2017. Retrieved 13 March 2017. ^ a b "Waterloo Region 1911". Waterloo Region WWI. University of Waterloo. 2015. Archived from the original on 21 March 2017. Retrieved 20 March 2017. ^ "Friedensfest (1871)". Waterloo Region WWI. University of Waterloo. 2015. Archived from the original on 21 March 2017. Retrieved 20 March 2017. ^ "Waterloo County, Plaque 24". Historical Plaques of Waterloo County. Wayne Cook. 2011. Archived from the original on 12 March 2017. Retrieved 23 March 2017. ^ a b "City on Edge: Berlin Becomes Kitchener in 1916" Exhibit at Waterloo Region Museum, on display 2016. ^ "Internment Camps in Canada during the First and Second World Wars". Government of Canada. 1 March 2012. Retrieved 19 March 2019. Some German citizens living in Canada were arrested and detained in internment camps. Because Canada also served as a place of detention for German prisoners of war on behalf of the British, they formed a large proportion of the internees. ^ "Mennonites and conscription – Wartime Canada". Web.archive.org. Archived from the original on 15 March 2017. ^ D'Amato, Louisa (28 June 2014). "First World War ripped away Canada's 'age of innocence'". Kitchener Post, Waterloo Region Record. Kitchener. Archived from the original on 15 March 2017. Retrieved 14 March 2017. ^ "Kitchener mayor notes 100th year of name change". Cbc.ca. Archived from the original on 9 January 2017. ^ "One hundred years after disappearing, Berlin (Ontario) shows signs of revival". Globe and Mail. 26 August 2016. Retrieved 19 March 2019. The declaration of war marked the beginning of vicious, violent antagonism on an international scale, and Berliners became collateral damage through a simple seismic shift of global alliances. ^ "ARCHIVED – Did You Know That… – ARCHIVED – Canada and the First World War – Library and Archives Canada". 30 June 2016. Archived from the original on 30 June 2016. ^ "HistoricPlaces.ca – HistoricPlaces.ca". Web.archive.org. Archived from the original on 15 March 2017. ^ "City of Kitchener – Industrial Artifacts". City of Kitchener. Archived from the original on 11 September 2012. Retrieved 6 September 2012. ^ "Fast facts about Kitchener" (PDF). City of Kitchener. Archived from the original (PDF) on 8 November 2012. Retrieved 6 September 2012. ^ "City of Kitchener" (PDF). City of Kitchener. Archived from the original (PDF) on 8 November 2012. Retrieved 6 September 2012. ^ "City of Kitchener". City of Kitchener. Archived from the original on 4 September 2012. Retrieved 6 September 2012. ^ "City of Kitchener". City of Kitchener. Archived from the original on 31 August 2012. Retrieved 6 September 2012. ^ "Kitchener Market". Kitchener Market. Archived from the original on 30 August 2012. Retrieved 6 September 2012. ^ "2010 Design Awards". International Making Cities Livable. Archived from the original on 3 June 2012. Retrieved 6 September 2012. ^ "City of Kitchener – The New King Street". City of Kitchener. Archived from the original on 29 October 2012. Retrieved 6 September 2012. ^ "Kitchener's King Street a Model for Yonge Street Festival". Metro News. Archived from the original on 4 September 2012. Retrieved 6 September 2012. ^ "City of Kitchener – UW Health Sciences Campus". City of Kitchener. Archived from the original on 8 November 2012. Retrieved 6 September 2012. ^ "Kitchener Finds its Groove in Industrial Past". Toronto: The Globe and Mail. 6 September 2012. Archived from the original on 27 December 2012. Retrieved 6 September 2012. ^ "The Tannery District". The Tannery District. Archived from the original on 30 May 2012. Retrieved 6 September 2012. ^ "Google's Kitchener team plays key role in Gmail redesign". www.cbc.ca. Archived from the original on 20 November 2015. Retrieved 20 November 2015. ^ "Velocity Garage". Velocity.uwaterloo.ca. 24 June 2015. Retrieved 7 August 2018. ^ "Company Directory". Velocity.uwaterloo.ca. Archived from the original on 14 June 2016. Retrieved 9 June 2016. ^ "City of Kitchener – Regional Courthouse". City of Kitchener. Archived from the original on 8 November 2012. Retrieved 6 September 2012. ^ a b "New Residential Developments". Downtown Kitchener. Archived from the original on 29 August 2012. Retrieved 6 September 2012. ^ "Desire2Learn finally accepts venture investment". Toronto: The Globe and Mail. 4 September 2012. Archived from the original on 6 September 2012. Retrieved 6 September 2012. ^ Pender, Terry (29 December 2017). "Boom Time: $1.2 Billion in Building Permits Expected for Downtown Kitchener". The Record. Archived from the original on 10 January 2018. ^ "2001 Community Profiles". 2.statcan.ca. 12 March 2002. Archived from the original on 17 May 2008. Retrieved 3 March 2011. ^ "Who is My Councillor? – City of Kitchener". City of Kitchener. Archived from the original on 17 September 2012. Retrieved 5 September 2012. ^ "Get to Know Us During Local Government Week". Waterloo Region. Waterloo Region. 10 October 2012. Archived from the original on 22 March 2013. Retrieved 23 March 2013. ^ "City of Kitchener". Kitchener.ca. Archived from the original on 6 July 2011. Retrieved 3 March 2011. ^ "Downtown Kitchener, Ontario, Canada – WLU Faculty of Social Work". Downtownkitchener.ca. Archived from the original on 4 March 2011. Retrieved 3 March 2011. ^ "College Profile / Stats | Among Canada & Ontario's Leading Colleges & Polytechnic Institutes | Conestoga College". Conestogac.on.ca. Archived from the original on 29 April 2011. Retrieved 3 March 2011. ^ "UW launches pharmacy program with 92 students | News, Media, and Events | University of Waterloo". Newsrelease.uwaterloo.ca. 16 January 2008. Archived from the original on 23 March 2011. Retrieved 3 March 2011. ^ "Waterloo Regional Campus". McMaster University. Archived from the original on 29 August 2012. Retrieved 7 September 2012. ^ "City of Kitchener – UW Health Sciences Campus". City of Kitchener. Archived from the original on 8 November 2012. Retrieved 7 September 2012. ^ "Hospitals". Region of Waterloo. 15 February 2011. Retrieved 30 December 2018. ^ "Waterloo Region hospitals rank well on readmissions, but wait times need work". Waterloo Region Record. 29 November 2018. Retrieved 30 December 2018. Area hospitals ranked well in patient readmissions, but wait times need improving. ^ "Long-Term Care Homes – Kitchener–Waterloo–Wellesley–Wilmot–Woolwich". Health Line. 3 January 2018. Retrieved 30 December 2018. ^ "About GRH". GRH. 15 November 2017. Retrieved 30 December 2018. ^ "Freeport Campus: 3570 King Street East, Kitchener". GRH. 15 November 2017. Retrieved 30 December 2018. ^ "Grand River Regional Cancer Centre celebrates 15 years of advanced cancer care this fall". GRH. 30 August 2018. Retrieved 30 December 2018. ^ "Regional Cardiac Care Centre". SMGH. 15 September 2018. Retrieved 30 December 2018. ^ "About Us". SMGH. 15 September 2018. Retrieved 30 December 2018. ^ "Banks take control of Cambridge hospital project". Waterloo Region Record. 29 December 2018. Retrieved 30 December 2018. BMO, as a lender and funder, called a performance bond to ensure there is funding to get the work done. Zurich Insurance is Bondfield's insurer. ^ "Doctor recruitment an ongoing issue in Waterloo Region". Waterloo Region Record. 18 September 2018. Retrieved 30 December 2018. BAlthough recruitment efforts over the past 15 years or so have brought many new physicians to the area, many residents are without a family doctor. ^ "WATERLOO REGIONAL CAMPUS". McMaster. 15 March 2018. Retrieved 30 December 2018. ^ "The Legacy". Kitchener-Waterloo Oktoberfest. Archived from the original on 15 February 2016. Retrieved 10 February 2016. ^ "Oktoberfest 2016 comes to a close". Archived from the original on 19 October 2016. Retrieved 29 March 2017. ^ "TheRecord – Lions move up but fall short". News.therecord.com. 27 May 2010. Archived from the original on 5 March 2010. Retrieved 10 June 2012. ^ "Destroy All Robots". CBC News. Archived from the original on 1 March 2016. ^ "Canada's Largest Free Blues Festival". Kitchener Blues Festival. Archived from the original on 20 April 2012. Retrieved 10 June 2012. ^ "K-W Multicultural Festival – Victoria Park, Kitchener". Kwmc.on.ca. Archived from the original on 20 June 2012. Retrieved 10 June 2012. ^ "KOI Music Festival". KOI Music Festival. Archived from the original on 26 October 2014. Retrieved 16 October 2014. ^ "Kultrun World Music Festival brings outdoor dance party to Kitchener". CBC News Kitchener. 8 July 2016. Archived from the original on 10 July 2016. Retrieved 12 July 2016. ^ "Kultrún World Music Festival". Neruda Arts. Retrieved 11 November 2018. ^ "Staff report regarding state of Kitchener's park system" (PDF). Kitchener.ca. Archived from the original (PDF) on 16 March 2012. Retrieved 10 June 2012. ^ "TheRecord – 21 Rosedene Avenue". News.therecord.com. 19 July 2011. Retrieved 10 June 2012. ^ "Take the Lane: Kitchener's new bike park". Therecord.blogs.com. 21 July 2007. Archived from the original on 8 July 2011. Retrieved 3 March 2011. ^ "City of Kitchener" (PDF). Kitchener.ca. Archived from the original (PDF) on 6 July 2011. Retrieved 3 March 2011. ^ "City of Kitchener – McLennan Park". City of Kitchener. Archived from the original on 29 July 2012. Retrieved 10 September 2012. ^ "Roundabouts – Region of Waterloo". Regionofwaterloo.ca. Archived from the original on 19 June 2012. Retrieved 10 June 2012. ^ "Strengthening Community". Waterlooians.ca. Archived from the original on 6 July 2011. Retrieved 3 March 2011. ^ "Transit Programs in GRT". Grt.ca. Archived from the original on 25 January 2011. Retrieved 3 March 2011. ^ "Rail plan passes". TheRecord. 15 June 2011. Archived from the original on 12 March 2012. Retrieved 20 February 2012. ^ Desmond, Paige (23 December 2016). "LRT construction 90 per cent complete". Waterloo Region Record. Archived from the original on 29 December 2016. Retrieved 25 March 2017. ^ Flanagan, Ryan (24 February 2017). "Bombardier '100% committed' to delivering Ion vehicles by end of 2017". CTV News. Bell Media. Archived from the original on 25 March 2017. Retrieved 24 March 2017. ^ "Ion launch delayed until December". Kitchener. 13 April 2018. Retrieved 5 October 2018. ^ "ION trains still on schedule for December launch". Global News. Retrieved 5 October 2018. ^ "ION testing". www.grt.ca. Retrieved 5 October 2018. ^ "RAPID TRANSIT ENVIRONMENTAL ASSESSMENT PHASE 2, STEP 3b – PREFERRED RAPID TRANSIT SYSTEM OPTION AND STAGING PLAN" (PDF). Archived (PDF) from the original on 13 January 2015. Retrieved 9 April 2015. ^ "ION Bus Rapid Transit – Frequently Asked Questions". Archived from the original on 25 March 2017. Retrieved 24 March 2017. ^ Sharkey, Jackie (8 February 2017). "There's still wiggle room in the Region of Waterloo's LRT plans for Cambridge". CBC. CBC. Archived from the original on 12 March 2017. Retrieved 10 March 2017. ^ Sharkey, Jackie (February 2017). "Stage 2 ION: Light Rail Transit (LRT)" (PDF). Region of Waterloo. Region of Waterloo. Archived (PDF) from the original on 25 March 2017. Retrieved 24 March 2017. ^ "Train Schedules" (PDF). VIA Rail. Archived (PDF) from the original on 2 July 2015. Retrieved 2 July 2015. ^ Jackson, Bill. "Province initiates EA for high-speed rail". Kitchener Post. Archived from the original on 28 March 2018. Retrieved 25 June 2017. ^ "Toronto – Kitchener – London Ontario High Speed Rail Pre-Feasibility Study prepared for Ontario Ministry of Transport Commercial in Confidence" (PDF). mto.gov.on.ca. p. 8. Archived (PDF) from the original on 4 July 2015. Retrieved 25 June 2017. ^ "WestJet Airlines". Region of Waterloo International Airport. Archived from the original on 5 July 2017. Retrieved 25 June 2017. ^ Weidner, Johanna. "Crane on skyline so Kitchener helipad closes". Waterloo Region Record. Archived from the original on 28 March 2018. Retrieved 25 June 2017. ^ "City of Kitchener". Kitchener.ca. Archived from the original on 8 September 2012. Retrieved 5 September 2012. ^ Daily maximum and minimum temperatures and precipitation were recorded at Kitchener from October 1914 to December 1977 and at Region of Waterloo International Airport from March 1970 to present. Wikimedia Commons has media related to Kitchener, Ontario. 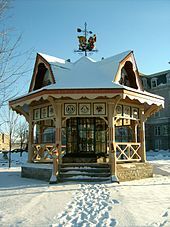 Wikivoyage has a travel guide for Kitchener.